On this day 4th November 1898 began the life of Violet Florence Mabey Lozuet. 1898 – On the 4th November Violet is born to parents John Lozuet and Clara Anna Mabey. Notice that one of Violets middle names is the maiden name of her mother. This was often done in the past and is still done now, especially when particular surnames are dying out. 1898 – On the 30th November Violet was baptised (details from St Helier Church Baptism Register, 28th July 1889 – 21st February 1909). Her godparents were her father John (a ‘Mariner’) and mother Clara. 1901 – Violet (age 3) is living in Don Road, Jersey with her mum, dad, and sisters Clara and Ada. 1911 – Violet (age 13) is living in Jersey with her mum, dad and sisters Clara, Ada. Mabel and Elsie. 1941 – Violet (age 43) is living at the St. Saviours Hospital. Also known as the ‘Mental Hospital’. 1992 – Violet dies at St. Saviours Hospital. It is not quite clear why Violets life turned out as it did. Nor is it known at what age she was admitted or under what circumstances she ended up in St. Saviours Mental Hospital. An old family rumour was that she was jilted at the alter and this sent her mad. Maybe she just had a nervous breakdown which today would not warrant being admitted into St. Saviours or maybe there was more to it, that we will never know. She had spent her whole life in the hospital and had probably become quite institutionalised. Family never came to visit her as far as the present staff knew. So we then asked my grandfather (Violet’s nephew) why noone knew about her, especially as she had still been alive all these years ? My grandfather didn’t know when she was admitted, but only that he must have been very young as he barely knew anything about her himself. Sadly it seems that family had forgotten about her. They were different times back then. People felt differently. This is why I am keen to find out more about Violet…I think she deserves that much! 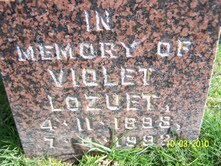 So, with Violet’s death at the grand age of 94, living longer than any of her siblings, the surname Lozuet died out too. That’s sad isn’t it. I’d be interested to know more. One way is to interview people who knew her at the hospital and put together the pieces of the jigsaw that way.